Sometimes it feels as though happiness is so elusive. One moment, you are brimming with gratitude and everything seems to have a little extra sheen to it, and then the next, we get dragged down to lower levels of consciousness through comparison and lack. Until we truly master our own minds, this fluctuation will be the norm that most people live in day to day. However, there are always tips, tricks and tools to help us refocus our attention on all the goodness that we are surrounded by. After all, we are all here having a human experience, so lets do our best not to be so hard on ourselves, ok? These are some of my favorite ways to move from any kind of negative emotions, to that sweet experience of happiness. There is magic in your smile, and this simple act can transform you and the world around you. Not only are smiles contagious, but every time you turn the corners of your lips up, your brain receives a little dose of neuropeptides that releases all the feel good neurotransmitters, like dopamine, endorphins and serotonin. So show off those pearly whites, and smile to yourself & others as often as you can. By now, you should know how much I love self-love. I even wrote an entire blog post on it! (here) Taking time to nurture yourself so that you can give more to others, and function more optimally is key to vitality, health, and happiness! This one can be scary, I know, because I've done it many times. (read my #MeToo post here) Owning up to your shadows and demons, with love, acceptance, patience, understanding and light is the only way we can truly free ourselves. We are all imperfectly perfect. We are all a work in progress and a masterpiece at the very same time. Hug all the parts of yourself that you hide from the world. You are worth healing. You deserve to know pure bliss and joy, always. Hugging is a powerful form of healing! Research shows that a proper hug, where the two hearts are touching, can help build trust and security, boost levels of oxytocin, which helps heal feelings of loneliness, and even strengthen the immune system. Hugs teach us how to give and receive. So next time you greet another wonderful human, take a few extra moments to truly embrace one another, and allow yourself to be embraced too. Considering we are made up of 70% water, I would say that it is quite important to make sure we stay hydrated! Glow yourself from the inside out. Water is essential for the proper circulation of nutrients in your body. Take care of the wonderful skin you're in and drink up. Health = Happiness. Another majorly important aspect of my life, and one of the main reasons I find total bliss in every day. Meditation. It truly is the key to everything. To knowing ourselves better. To understanding ourselves and in turn the world around us more meaningfully. If we can connect to ourselves, in that pure and innocent way that meditation provides, we can have more meaningful connections with those around us. Not just humans, but plants, animals, even expressing deeper appreciation for objects around us. I whole heartedly believe that if we all practiced meditation regularly, the world would be rid of all of its problems. Bye bye depression, wars, separation, and hello happy!! Meditation truly helps us be more present. To be in each moment as it arises, rather than getting caught up in the future or past. When we dwell in the past, we are reliving old moments, stuck in a loop, projecting the same experiences into our future. When we anticipate the future, we get overwhelmed with anxiety. So lets make an effort to be HERE. Now. Right here. In this beautiful and perfect moment. Smile! To some, this concept comes very naturally & to others, well... not so much. It can be a real challenge, especially with the qualms of social media, where we feed off of likes and approval, to not care about what others think. But let me tell you, it might be the most freeing experience to finally let go of the need to fit yourself into someone else's mold of who they think you should be. Only YOU know what is best for you. By the way, you don't have to go to college, get a job, get married, buy a house, have kids, or any of the other ideals that society deems necessary for a fulfilling life. You can travel. Make your own job. Wear whatever the hell you want. Be who YOU want to be. Because you are the only one living your life, my friend, so make it one that fills you to the freaking brim with joy. Every. Single. Day. I love gratitude. It turns what we have into more than enough. Go from a state of lack to one of abundance in moments!! Look around you, RIGHT NOW. What can you be grateful for? How about a device to read this on. How about those eyes you're using right now to read these words? How about those beautiful lips you have to smile with? Or those arms you have to hug with? How about the food and the water that nourishes you? Or the fact that today, you are alive? I love my 5 Minute Journal for expressing gratitude every day. Oh, and I am SO grateful for you, you beautiful human you! You know by now how much I value the importance of SELF LOVE. With Valentine's Day around the corner, I feel like it can be easy to slip from a place of making YOURSELF a priority, to looking around for outside sources of validation. Well let me be the first to say, uh huh honey!! You don't need anyone else but your perfect self to be happy, whole and complete. Last week, I teamed up with two of my favorite babes, Sjana Elise and Alyssa Lynch to give you a week's worth of self love challenges. We called it #AMSWellnessWeek. I wanted to offer you all a few ways to practice self care on your own time, hopefully a little bit every day! Our society values being busy as being productive and successful, but without rest, having a full schedule is only sustainable for so long. Give yourself permission to rest. Sleep when you're tired. Go to bed early. Don't set an alarm when you don't have to. Enjoy your zzz's! Whether it is yoga, a hike, or dancing around your living room in your undies, MOVE YA BODY. Trust me, it feels good! Even if you're stiff, just take 5 minutes to stretch and breathe and send your little muscles and bones all of your love. You know I can't stress this one enough! Meditation has changed my life, and has made it easier to navigate through all of life's challenges and surprises. You don't have to escape to a cave in the mountains to experience the bliss of meditating, even just for 5 minutes. Click here to find all of my guided meditations. KNOWLEDGE. STUDY. ESCAPE. Since I was a child, I've always found a welcome escape in the pages of books. While I don't spend much time reading fiction anymore, I do enjoy the fantasy of experiencing another world. There is so much to learn in this lifetime, and books hold magical keys to so many of our questions. Click here for a list of some of my favorite books. Set a mood in your home with a few candles. Turn off the harsh lights and let the gentle glow nurture your soul. Try gazing into the flame to feel a deep sense of presence and connection. Make it a ritual. Baths are one of my ultimate forms of self love. Light candles, throw in a few flower petals, a couple of drops of essential oils to elevate your sacred time. If you don't have a bath, tie a few branches of eucalyptus to your shower head for some spa like vibes. We've all heard the word 'yoga' before (or maybe not) and have created some sort of idea of what yoga is... Some people might think of it as chanting, meditation, or a bunch of hippies dancing around a yoga mat. Some people might define yoga as a workout class, others, an escape. The word yoga literally translates to "to yolk" or "union," and although the physical asana, or posture, practice can definitely be a workout, it is so much more than that. I was 18, and had barely lived in NYC for 3 months. At this point I was spending more time getting blacked out / being hungover in my dorm room bunk bed than being a productive human/ college student. (yes, I had a fake ID... rebel!) My roommate / high school BFF was always connected to the coolest people at the hottest clubs. We never waited in lines, and always drank for free. It was easy to escape. I didn't really know what I wanted to do. I moved to NY on a whim, chasing a boy that didn't want to be chased, setting myself up for heartbreak and drowning in toxicity. I was lost. I was unsure. I was avoiding myself at all costs. It was my friends mom who looked at us one day (I'm sure we we wreaked of booze) and said, "What are you girls doing to yourselves? You need to take care of your bodies. You need yoga." So we went to yoga. I'd done yoga in high school, purely because the thought of running a mile made me nauseous, and it was considered an easy A kind of class. But I was never, EVER, let me repeat, NEVER physically inclined. I tried to go out for different teams, but never made the cut. I didn't run, I didn't dance, I didn't surf or snowboard or play volleyball or soccer, or anything for that matter. I drew, and I sang, and I did theatre. Flexible? No. Hard no. Strong? ha! No. I was devastated. I moved back into my mom's house after having lived on my own for almost a year, and I felt like a total failure. A real loser. I was no longer in that toxic relationship, but at the time it felt like it was my whole world. I hated my life and I hated myself. I had been struggling with depression and eating disorders for a couple years at that point (boy are my teenage journals dark and dismal) and honestly, all I wanted (dreamed of, hoped for) was to go to sleep, and never wake up. But every day, I woke up. I didn't know what to do with myself, but a small voice, somewhere inside of me whispered, "yoga." I didn't question it, I just found the closest donation studio and started practicing. I didn't have any money, and I remember pretending to put money in the donation box after classes and run out of the studio as quickly as possible so that no one would catch me and I could come back and practice. It was Dan Ward, a wonderfully kind teacher, who I connected with. I remember him trying to give me adjustments in forward folds, and my whole body rejecting the idea of my fingers ever reaching my toes. But he saw something in me and always encouraged me to come back. It didn't matter that I couldn't afford classes, he knew I needed yoga, even if I didn't know what yoga really was. Those classes became the only thing that pulled me out of my darkness. I have a distinct memory of walking out of class one afternoon, and feeling like my feet weren't even touching the ground. Like I was floating. I felt so free. I had the sudden and deep realization that happiness was not something that you can get from anyone or anything outside of yourself. Happiness is something you create within. I asked Dan, "So what is yoga? I mean... how can I be doing these poses, and feeling so good inside?" I was baffled, intrigued, and I needed to know more. He told me about something called a 'teacher training.' I asked where he did his, and I went straight home and signed up for the next one. I did my 200 hour YTT with Tamal Dodge that November, about 6 months after I started practicing regularly. I just wanted to know more. I didn't know if I wanted to be a teacher, I was barely 19 years old! But I dove in, because my intuition told me to, and I didn't question it. Another 6 months of this passed by, and all of a sudden, the Universe was urging me to make some major life changes. The studio was going to close, among other things, and I ended up buying a one-way ticket to Costa Rica. Pure Vida! I had reached out to a hotel and they needed staff! I couldn't have been more excited. I moved there and started teaching 2 classes every day, right away. This is where I began to find my voice as a teacher. Until that point, only teaching 1 class a week just wasn't enough for me to learn how to clearly convey my message, or even figure out what my message was. Practice. Practice. Practice. I learned how to teach 1 person, and I learned how to teach to a group of 20 people. All I did was teach. I read and studied philosophy and theory and anatomy, and I taught. I really felt like I had found my purpose. I knew I had to share this message with as many people as I could. This connection to self. This magic that is within and ready for us to tap into at any point, no matter what. This is what I aim to share. Now, its been almost 7 years! I've taught yoga all over the world. I've recorded classes online. I've taught yoga wearing a microphone to a hundred people. I've ever taught yoga on a yacht! This journey, this practice, is ever evolving. Its humbling because one can never 'master' yoga, one can only embody it more and more. I have so much to learn, and so much to share, and this feels like it's only the beginning. I'm just getting started. Click here for my online yoga class bundle. Click here for my free youtube classes. Click here to sign up for my next retreat! The Lunar cycle is a beautiful dance between the Sun, the Moon and the Earth. With this dance, comes a natural rhythm of energy which permeates through our cosmos. Each cycle begins and ends with the New Moon, giving us a schedule to align with and use to help design the life of our dreams. 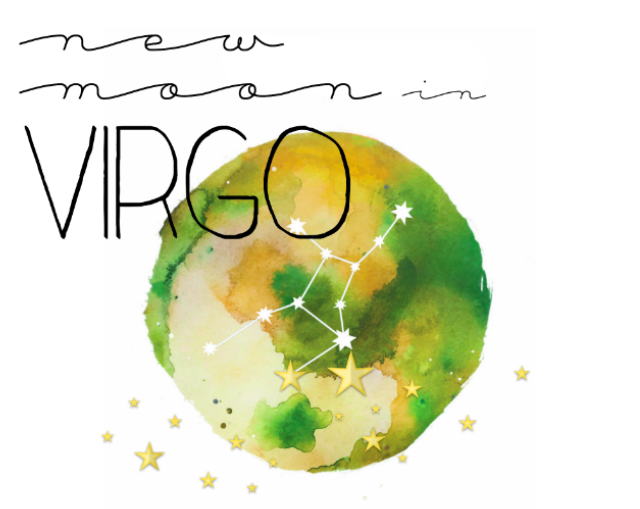 Today is the New Moon in Virgo, which means on this day the Moon will join the Sun within the constellation Virgo. Hence, the New Moon ritual every month. Now becomes the question of Virgo. Each month we are graced with the energy of another zodiac sign. This adds, or I like to think it “flavors,” the energy of the New Moon. Each zodiac sign has certain inherent qualities associated with its presence in our sky. We can align with these qualities to theme the type of things we are thinking about and planting seeds for each New Moon. 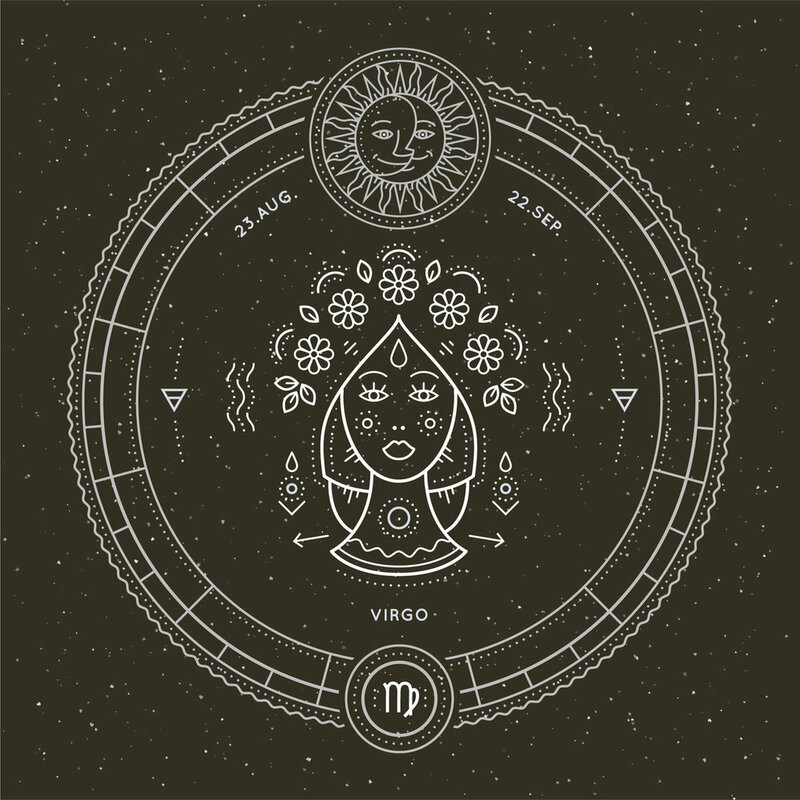 Virgo is a the sign of the mother, the Goddess and the virgin. She is discerning, detailed and likes to have things in order. She is all about the little things and reminds us that small steps on our journey are just as important as the large ones. She is pure in her intentions and helps us purify our mind and body. A true healer, Virgo reminds us how to take care of ourselves and take care of others as well. She rules her kingdom through service, not power, and is always willing to help any way she can. This applies to everything from your energy to your sock drawer. Create an ideal weekly schedule that makes you feel productive but not overwhelmed or exhausted. Remember, Virgo is a very healing so take care of yourself and your energy through daily habits of eating well, meditation and exercise. Use routines to help streamline your energy so you feel focused, calm and inspired. Since the Moon is linked to our emotions, now is great time to sort out how you feel about things. What, or who, brings you the most joy in your life? Is there something or someone that you have mixed emotions about? How can you cultivate a life where everything is a resounding yes? Spend the days leading up to the New Moon thinking about these questions. Shed anything that no longer serves you in becoming the person you where meant to be. Use this practice to align with your potential as the the Moon aligns with the Sun. You can set up a ritual space for yourself with crystals and other objects, or simply find a quiet place and a nice journal. Take a few minutes to still your mind and say to yourself “I am open to receiving guidance and intuition.” Then begin writing, state what you want to the universe very clearly and detailed. You can use the theme of Virgo to help direct you, but it's completely up to you on what energy you want to call into your life. A great example for Virgo is to call in the information needed to organize your plans into small step and the patience to watch them unfold into larger dreams. Don’t limit yourself in anyway, instead dream bigger. Once you’ve written what you would like, be grateful for it as if it’s already part of your world. Image you have your ideal life already, see it, feel it and be grateful for it. This act of gratitude will tell the universe you are ready to receive the energy and your intentions will manifest like magic. Throughout this process be open to receiving information. Be open to the possibilities of everything you intend coming true. Believe 100% in your heart and mind that your intentions will manifest into reality. Have fun with the practice! New Moon’s are a magical time for us to dance with the Moon’s rhythm and align with her energy. Above all, trust the process. Happy New Moon! We are in a time of great transition. Late summer is a season in and of itself. At least here in LA, it is still scorching hot (hotter than its been all summer), and while I am aching to add sweaters and boots, instead I am peeling off the layers, both physically and metaphorically. I wonder if anyone else felt the intensity of August, of both of the eclipses, and their deep and profound effects? It was a very hard and telling month for me. It started off strong, and I was told it was a time of transformation. I was told that I would not be the same person by the end of the month. I had my doubts, but honestly, I feel like I've faced my darkest shadows and obliterated them with the brightest light I could muster. It has been hard. It has been revealing. I cried. I yelled. I cowered in a corner. I wrote, feverishly, and tore out the pages and burned them. I finally let it out of me. And I was supported. And now, I feel light. And free. And I realized I was the only one in my way all this time. But enough about my melo drama, (thanks for listening though) I want to talk about how YOU can move through this transition between bikinis and pumpkin spice lattes (lets be real, do you even like pumpkin spice lattes?!). In Chinese Medicine, there are 5 seasons, Late Summer being one of them. Its easy to feel ungrounded when things are changing, which means it is especially important to stay centered. Rooted. So as not to get caught up in the chaos. If there is movement both around you and inside of you, it can feel like there's nothing to hold on to. Earth is the element of Late Summer. Makes perfect sense. Earth. It is our biggest constant, yet it is always changing! Just like us. So HOW can we stay centered? The first step is to stay present. Know where you are, and who you are. Bring your awareness to your left side. Your feminine side. Your intuition. Now bring your attention to your right side. The part of you that is out in the world. The hand that makes the deals and signs the checks. Bring your attention to your backside, your heels, the nape of the neck. This represents your past. Your experiences. Now bring your attention to your front side. Your heart. Your eyes gazing forward. This represents your future. Your potential. Now put yourself on a central axis, right in between all 4 polarities. Here. Now. Breathe in. Breathe out. From this vantage point you can see all around you. You can practice this visualization to center yourself as often as you need to. We are at a point in the year where we have had enough experiences to look back and reflect upon, and still plenty of time ahead of us to make changes and take action. At this time we are making the shift from the outward, social expression of summer to the the inward focus of fall and winter. - Where are you right now? Where do you envision yourself? - Do you tend to move quickly or do you enjoy taking your time? Is it challenging to do the opposite? - In what ways have you used your creativity & passion? -In what ways have you cared for yourself? -Which 'seeds' (of intention) can you tend to more carefully? "Effort and surrender are like two wings of a bird. Both are necessary for a smooth and joyful flight." When effort and surrender combine the result is pure ecstasy. If we approach our yoga with a playful attitude the balance of effort and surrender becomes second nature. The ego may want to perform a particular pose for show but the body or mind may not be ready. If we try to force the pose with our will, we may cause injury. It is easy to cling to physical ideals, but our bodies are all different. So instead of forcing your way into a pose, ease and explore your way into it with gentleness and compassion supported with a strong foundation of the awareness of your breath.Working from your center gives your pose its power. Playing the edges helps to rediscover your center. Yoga is dynamic. It pulses with the breath and with the beat of nature. There is always a new discovery, an awakening if you remain open to it. Bring this energy and attitude into your practice and feel your whole life blossom. I slipped into a dark place yesterday. It started with a small thought that quickly escalated into a full blown takeover by some evil force that we can refer to as the ego. I began my morning on what I thought was a great start, despite having not slept well and woken up too early. I kept my phone on airplane mode, put in my headphones and meditated. Sometimes my mediations are rocky. I feel like my mind is doing everything it can to take me out of the present moment. Trickery. And then I opened Instagram. While I usually find great joy and inspiration as I scroll through my feed, all of a sudden I felt small. Unimportant. Invisible. I started comparing myself to others. Thoughts like, "why do they have more followers than me, when they're posting that?" or "Why do I even put so much time and effort into Instagram when no one cares (about me)" and so on, started to rear their ugly heads into my headspace. I'm not good enough. I'm not beautiful enough. I'm not skinny enough. I'm not worthy of success or fame. No one cares about me. I should just give up. They're miserable. They're all encompassing. And it can be really hard to let. them. go. But really hard doesn't mean impossible. With the help of my (very kind, very grounding) boyfriend, Milo, I dissected each thought and addressed it with a question. My goal is to create a shift - a paradigm shift - one that allows us ALL to deeply realize that we are all made up of such divinity that we can create anything in this life. We are connected, not separate. We are not lacking in anything. We are whole. We are the essence of God in physical form. We are here to play and connect and adventure and explore. Not to compare and criticize and judge. We are not here to live a life that is based in fear. We are here to love. Each other and ourselves. It can be challenging to remain unaffected by those sneaky negative thoughts. Those thoughts of comparison that rob our joy of all that we are. Those thoughts of judgement stealing away how perfect we already are. Those thoughts are not real. They might feel real, and they might feel powerful, but I promise you, they are not. And they only have the power we give them. So next time you become aware of these thoughts, (you can always check in by asking yourself how you FEEL), I challenge you to take a step back. Ask yourself if this thought is true. Ask yourself if this thought makes you feel heavy, or if it makes you feel lighter. If it makes you feel heavy, LET IT GO. Replace it with a thought that makes you feel good. Gratitude is an excellent place to start. Cant think of anything to be grateful for? How about for this day. For the fact that you woke up. That you can breathe and see and give love. Start small. Gratitude for the clothes on your back. We are all so blessed. And we have an opportunity to heal. Lets use social media as a catalyst for love and for growth. Instead of creating competition, or being riddled with jealousy, look for love. Be kind for no reason. Give yourself a hug. Smile! You are alive. Share love as much as you possibly can. With everyone you meet. You've most likely heard about the Solar Eclipse on Aug 21st. It and all its magic are headed towards us and we in America have the great privilege of witnessing it in its entirety. During a total Solar Eclipse, night becomes day, stars come out, animals get quiet and shadows refract. It’s going to be quite the event! To see the total Eclipse you must be within a 70 mile band that runs from Oregon to South Carolina, otherwise you can see a partial Eclipse from almost any where in America. Wherever you may be, the effects will ripple through the country and the world, affecting us and our more importantly our energy. Solar Eclipses are essentially supercharged New Moons. They actually only occur on a New Moon, making them the perfect time to give your mind and energy a reset so new intentions can be created and manifested at lightning speed. Eclipses have no timeline, changes and shifts can happen in a blink of the eye and anything is truly possibly if you just dare to dream it. Things that you thought would take weeks or months can happen overnight, while things you thought would move quickly may drag their heels. Eclipses are grand opportunities to realize your evolutionary potential. They can provide you with insight to the reason you were put on this planet. You may experience “hits” of inspiration around the Eclipse that give you glimpses of what your soul truly craves. You may learn things about yourself you never knew before but now completely resonate with you. Are you making the best out of your human experience. Or are you just plugging along, going through the motions of a life your soul is only half in? Eclipses create portals that allow you to shift into a life that fulfills your destiny. The most important thing to remember during this Eclipse season, is to stay out of fear. The Eclipse itself (day to night) and the energetic shifts it causes can drum up some anxiety and fear in your psyche. Just be aware of this, acknowledge its presence but don’t let it take control of your mind. Minds tend to like familiarity, even if it’s not good for you. When your life begins to shift, the mind can freak out. Calm yourself with meditation, yoga and a gratitude practice. I like to write 3-10 things I’m grateful for every morning, especially during times of change in my life. Staying in gratitude will keep the fear at bay. Enjoy the process. Eclipses are a magical time for us to interact with and experience the universal energy. Be open, stay out of fear and of course find love in everything you do at this time. If it’s not a resounding yes, it’s a no. Trust yourself, your intuition and trust the universe will support you in taking great leaps of faith. Know you are on the path of living a life aligned with your soul’s purpose. Lastly, have fun and celebrate this time! It’s an extradorinaiy event that doesn’t happen everyday. It is a great reminder of our vast universe and the immense energy we are exposed to every day. Take the time to enjoy it and play within its beauty.